The NCAA just took a shot at Jim Harbaugh. But who really got hit? The NCAA banned satellite camps last week, which means Harbaugh cannot take his Michigan staff around the country this June the way he did last summer. But by doing so, the organization passed a dumb, restrictive rule that will limit opportunities for the players and schools that need them most. Effective immediately, college coaches cannot work any camp that is not on their own campus. 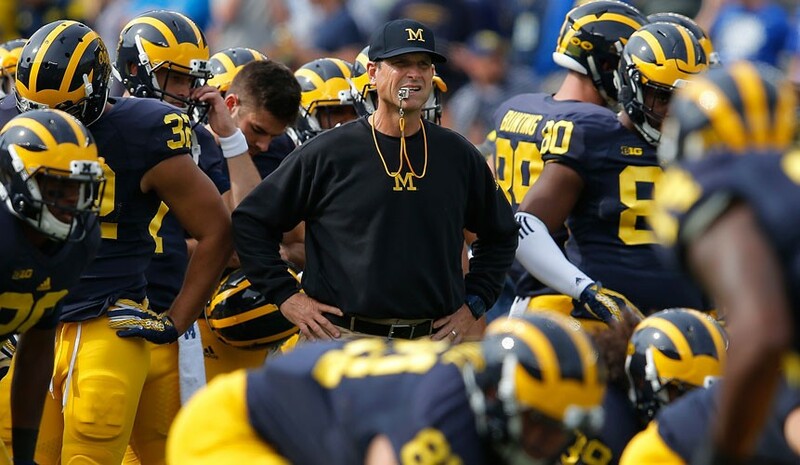 As Harbaugh tells SI : "The incompetence of the NCAA has reared its ugly head yet again." From there, Harbaugh really got going, firing at the NCAA's use of the term "student-athlete," a certain SEC head coach and the two conferences (the SEC and the ACC) that seem to benefit from this ban. However, Harbaugh wants to be clear: The NCAA is not some nebulous group of bureaucrats. It is comprised of the people who work in intercollegiate athletics. Coaches, athletic directors and school presidents make these decisions. And they completely botched this one. "I mean, what's it based on? A survey? There wasn't a lot of discussion or study. What are the facts? What are the perils and merits of making that decision? It just seemed lacking in that regard." College sports serve two missions: They are a multi-billion dollar business, and they provide opportunities for young people. With this new rule, as with so many, business trumps educational opportunities. The only thing the NCAA protected is the recruiting territory of the SEC and the ACC. Harbaugh says, "This is going to affect thousands and thousands of people." That is no exaggeration. It will affect thousands and thousands of people. To understand why, let's look at what the NCAA really did. Harbaugh famously took his staff on a well-promoted "Summer Swarm" satellite camp tour last summer. Anybody at a big-budget program could have done it; Harbaugh was simply the one who came up with the idea. But summer camps have been around for decades, and pretty much everybody in football would agree they have been a boon to the sport. High school players learn from the best coaches in the sport. More importantly, for the price of one camp, they can get in front of several coaching staffs and potentially earn a scholarship. And even more important: Players get a taste of success. They get a little closer to their dreams. If you have spent any time in impoverished neighborhoods, you know that the problems there go beyond finding food to eat and a roof to sleep under. People feel completely disconnected from their aspirations. Camps help bridge that gap. Most kids won't earn scholarships to Michigan, Ohio State, Alabama or LSU. But they may be inspired to work harder and to keep their grades up, which could help give them a chance to go and succeed somewhere. Harbaugh points out the hypocrisy: "During the NCAA basketball tournament we discuss the term 'student-athlete' ad nauseam in promoting our governing institution and our member institutions. Then, when we have an opportunity to truly promote the 'student-athlete' with a concept shared by educators and football men from all backgrounds, our leadership goes into hiding. "I suggest we drop the term 'student-athlete' for consistency." You can dismiss Harbaugh as acting out of self-interest, but keep in mind: A) anybody could do what he did last summer, and B) one of the people most upset by this ruling works on the staff at Michigan State. Yes, Michigan State. Curtis Blackwell is the Spartans' director of college advancement and performance. He is also the founder of Sound Mind Sound Body Football Academy in Detroit. It's a two-day camp. Football covers less than 50% of it. But for $90, kids get to attend life-skills workshops and get in front of coaches from a variety of programs. Last year more than 30 college head coaches showed up, including Urban Meyer, Mark Dantonio, Brian Kelly, three Pac-12 coaches and Harbaugh. Many underprivileged kids have earned college offers at Sound Mind Sound Body over the years. They may not have been good enough for Notre Dame, but they attracted interest from smaller schools. "When kids come out to a camp like Sound Mind Sound Body, it gives hope to young people," Blackwell said. "If they play football and bust their butts, they deserve to have opportunity they can one day be there. They can walk on and go to college, that's a win-win. That's our duty as leaders." The Sound Mind Sound Body camp was supposed to go national this year, with stops in Los Angeles, Houston, Tampa, Atlanta and Washington, D.C. Any college coach is welcome. Any player can sign up, as long as there is space. Why would anybody want to stop this? Isn't this the purported mission of college sports—to give young people a chance? 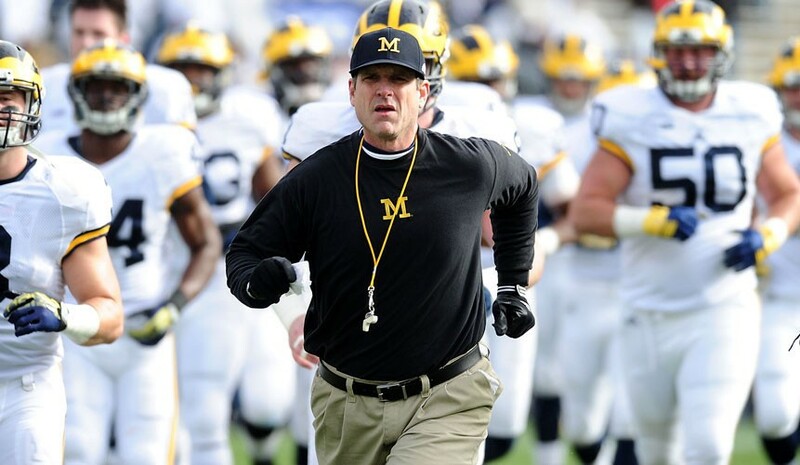 "It seems to be outrage by the SEC and ACC," Harbaugh says. "They power-brokered that out ... the image that comes to my mind is guys in a back room smoking cigars, doing what they perceive is best for them. It certainly isn't the best thing for the youngsters. It's not the best thing for the student-athletes." Harbaugh saw Ole Miss coach Hugh Freeze say, "I'm away from my family enough, and I just did not want to go," and it did not sit well with him. Says Harbaugh: "You've got a guy sitting in a big house, making $5 million a year, saying he does not want to sacrifice his time. That is not a kindred spirit to me. What most of these coaches are saying is they don't want to work harder." Even if the NCAA really was worried about that, there would be a simple solution. Cut the number of days a coaching staff can work off campus. Knock it down from two 14-day windows to one 7- or 10-day window. That would limit tours like Harbaugh's "Summer Swarm." But it would still allow coaches from many schools to work the same camp. So, what happens now? Parents of rising seniors must scramble. Players who can't afford to travel to a lot of camps are stuck. Scholarships will still be doled out, of course, but since coaches are more likely to hand them to players they see often, more of those scholarships will go to kids who can afford to travel to camps. And the smaller colleges are stuck, too. Many of them do not even hold their own camps; they work camps at bigger schools and get to see players there. Now if a MAC or Sun Belt coach wants to work a camp, his school has to host it, which is expensive. Those coaches won't see nearly as many players anyway. Former UNLV men's basketball coach Jerry Tarkanian once cracked that the NCAA was so mad at Kentucky, it gave Cleveland State two more years of probation. We now have a modern corollary: The NCAA is so mad at Jim Harbaugh, it punished Kent State and a bunch of kids from Detroit.